Herbs or subshrubs , 1-16 dm. Leaves opposite or nearly opposite, rarely alternate. Leaf blades elliptic, lanceolate to broadly ovate, 5-18 × 2-10 cm, almost glabrous on both surfaces or abaxially densely short-pilose or puberulent, adaxially scabrous. Inflorescences spikelike, often leafy at apex. Flowers in remote or crowded clusters of 1-few staminate and several pistillate flowers or rarely staminate and pistillate flowers on different plants. Achenes ovoid to nearly orbicular, 0.9-1.6 × 0.9-1.2 mm, almost glabrous or pubescent with straight and hooked hairs; seeds prominent, conspicuous in outline, surrounded except at base by corky tissue. 2 n = 28. Flowering summer-fall. Alluvial or moist, deciduous woods, swamps, bogs, marshes, wet meadows, ditches; 0-1800 m; N.B., Ont., Que. ; Ala., Ariz., Ark., Conn., Del., D.C., Fla., Ga., Ill., Ind., Iowa, Kans., Ky., La., Maine, Md., Mass., Mich., Minn., Miss., Mo., Nebr., N.H., N.J., N.Mex., N.Y., N.C., Ohio, Okla., Pa., R.I., S.C., S.Dak., Tenn., Tex., Utah, Vt., Va., W.Va., Wis.; Mexico; West Indies; Bermuda; Central America; South America (Argentina, s Brazil, Paraguay, Uruguay, and Venezuela). Populations of Boehmeria cylindrica are disjunct in South America. Plants with thick, often drooping, lanceolate leaf blades, more or less pilose or puberulent abaxially, scabrous adaxially, with short petioles, pilose or puberulent stems, and densely pubescent achenes have been called Boehmeria cylindrica var. drummondiana . These plants are found mostly, but not exclusively, in the southeastern United States and are totally sympatric with more typical plants. The above characteristics may or may not occur together, and each grades into the state found in more typical plants through abundant intermediates. Field and experimental studies are needed to clarify the biologic basis of this variation. Plant: perennial, rhizomatous herb or subshrub; 0.1-1.6 m tall Leaves: opposite or subopposite, rarely alternate; blades elliptic, lanceolate, to widely ovate, 5-18 cm long, 2-10 cm wide, subglabrous on both surfaces to scabrous adaxially and densely short pilose or puberulent abaxially INFLORESCENCE: spikelike, often with a tuft of reduced leaves at the apex Flowers: in remote or crowded clusters of 1-few staminate flowers and several pistillate flowers or, rarely, all flowers of one kind; STAMINATE FLOWERS with 4 tepals, 4 stamens, the rudimentary pistil represented by a globose structure; PISTILLATE FLOWERS with the perianth parts fused and adnate to the ovary; style elongate, persistent; stigma linear, straight, or hooked Fruit: ACHENES flattened, ovoid to subcircular, 0.9-1.6 mm long, 0.9-1.2 mm broad, subglabrous or bearing straight and hooked hairs; seed shape clearly apparent through the tightly adnate calyx, surrounded except at the base by corky tissue Misc: Swamps, bogs, marshes, wet meadows, ditches REFERENCES: Boufford, David E. 1992. 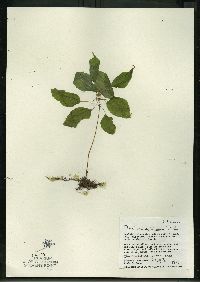 Urticaceae. Ariz.-Nev. Acad. Sci. 26(1)2. Perennial herb or subshrub 10 cm - 1.6 m tall Stem: erect, usually unbranched, lacking stinging hairs. Leaves: opposite to nearly opposite, rarely alternate, long-stalked, 5 - 18 cm long, 2 - 10 cm wide, elliptic to lance-shaped or broad egg-shaped with a pointed tip, toothed, nearly hairless on both sides or short-haired beneath and rough above but lacking stinging hairs. Flowers: either male or female, usually found on the same plant (monoecious) and often in the same cluster, borne axillary on a spike that is often leafy at the tip, each flower tiny with four tepals. Fruit: an egg-shaped to nearly circular achene, 0.9 - 1.6 mm long, 0.9 - 1.2 mm wide, nearly hairless or with straight and hooked hairs. Similar species: Pilea pumila and Pilea fontana are usually hairless, and Laportea canadensis and Urtica dioica have stiff, stinging hairs in addition to flexible, non-stinging hairs. Parietaria pensylvanica differs by its alternate, non-toothed leaves. Habitat and ecology: Wet areas such as marshes, bogs, and floodplain woods. Etymology: Boehmeria is named after Georg Rudolph Boehmer (1723-1803), a Botany professor at Wittenberg. Cylindrica means cylindric. Infrequent to frequent throughout the state in low places in woodlands and less frequent in marshes and wet prairies. [Variety drummondiana, plants with drooping, folded leaves, relatively short petioles, and purple splotched achenes, are] infrequent to locally frequent in the lake area in open marshes, infrequent to local in wet places in woods and wet prairies, and rare in low places in woods or in springy places in the southern part of the state. It is to be noted that this variety intergrades into the species and intermediates are found that are difficult to place. The scabrous upper surface of the leaves is not a constant character and is of little value. The long-acuminate apex of the leaves generally holds for the species. The length of the petioles, drooping leaves, and purplish achenes are the most reliable characters for their separation. The wings of the achenes are variable in both the species and the variety. Sometimes they are developed more on one side than on the other; they may extend to the base on both sides or on one side only; the mass of them may be below the median line or it may be above it. On the whole, the achenes with their wings are about 1-1.25 mm wide in the species and 1.25-1.5 mm wide in the variety. It is possible that the alkalinity of the soil has a decided influence on the plant since most of my specimens are from a more alkaline soil than are those of the species. The stem of the variety is usually much more uncinate-pubescent than the stem of the species.